Profile of Norfolk Southern’s recently appointed company photographer, Casey Thomason, a presenter at Conversations about Photography 2013. (A full-time photography position at a railroad? Shades of the past! And very welcome, too.) There is also a spread of Hal Lewis’s work from the 1950s until recently, especially notable because (1) he has given his photographs and negatives to the Center, and (2) because he was in the forefront of making railroad photography and railfandom into a diverse racial community. Then there’s an exceptionally rare 1850s daguerreotype of an Illinois Central locomotive at Bloomington, Illinois. 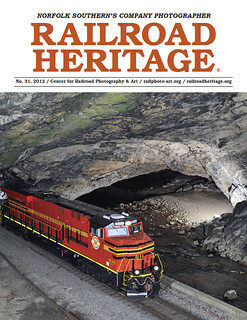 More than 160 years of railroad photography represented in one issue. $7.95, 24 pages, color and b/w.